On this page you will find our vibrant glass bicone beads. We also have bicone crystals available, see the menu left 'crystals'. These colourful beads are drilled through the centre of the cubes. These handy beads are so versatile, you'll wonder what you ever did without them! 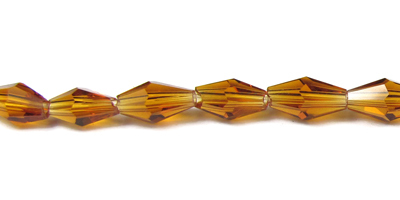 Full strand of elongated bicone crystal beads. Interesting shape! Full strand of elongated bicone crystal beads. Interesting shape!Bead size: 5x5mm long, 3.5mm wide.Beads per strand: Approx.